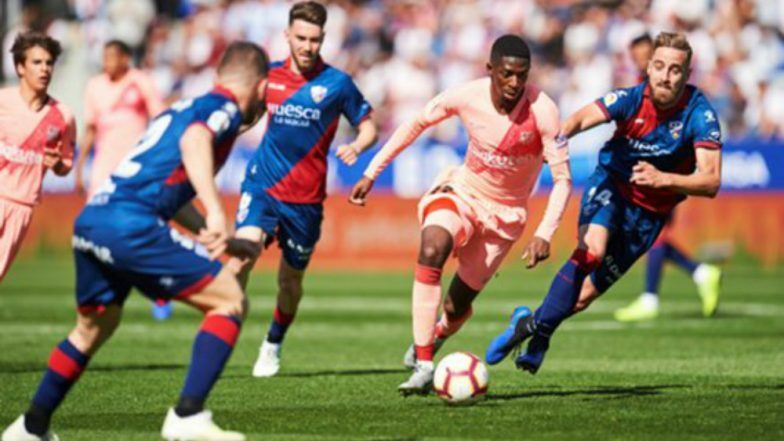 Huesca, April 14: Huesca held first-place FC Barcelona to a scoreless draw, earning a rare moral victory in an otherwise disappointing season. Barcelona head coach Ernesto Valverde opened the door for Huesca by resting practically all his regular starters with an eye on the second leg of the team's Champions League quarter-final match with Manchester United on Tuesday. La Liga 2019: Lionel Messi's Free Kick in 90’ and Luis Suarez Last Minute Goal Lead Barcelona to 4-4 Draw vs Villarreal. With the draw on Saturday night, Barca (74 points) provisionally boosted their lead to 12 points over second-place Atletico Madrid, which will take on Celta Vigo on Saturday evening, reports Efe news. The one point that Huesca (25 points) earned, meanwhile, did little to improve their situation, as the last-place club are still five points deep in the relegation zone with six games remaining.